Salt Grass Steakhouse is an interesting experience. It is an excellent example of 21st Century Corporate Steakhouse. The chain was founded in Dallas and currently operates locations in five Texas cities and four other states. They take pride in their use of garlic butter and their special Salt 7 Sauce on all steaks. 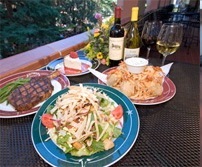 Their menu is much more extensive than the smaller local restaurants and includes lots of entrees beside steak. They also offer creative items like Shiner Bock Beer Bread and Two Fork Cheesecake. Some critics have complained about service or food quality at other locations, but the Riverwalk Salt Grass is apparently one of the chain's best, because it has earned consistently good reviews in both categories. The Salt Grass name comes from the Gulf Coast. 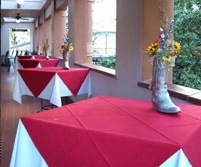 During the 1800s, ranchers east of the line drawn along San Antonio-Austin-Waco-Dallas learned that if they drove their cattle "Down East" in the Winters and let them graze on the salt grass, the cattle prospered and their steaks took on a particularly rich flavor. So many ranchers drove their cattle down gthere that a Salt Grass Trail developed and remained a well known route until well into the 20th Century, when roads began cutting it off. 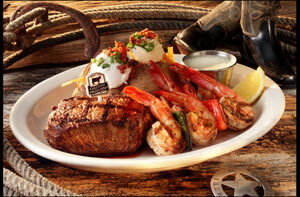 Salt Grass folk argue that 54% of all steaks are USDA Choice, but only 8% are Certified Angus Beef. Salt Grass supposedly buys Certified Angus steaks. Critics say Salt Grass kitchens are distracted preparing other menu items and lack time to focus on preparing steak. Marketers have surveys showing that customers, especially women and children, like those other menu items. So it depends on what you want in a restaurant. Salt Grass items are creative and tasty. 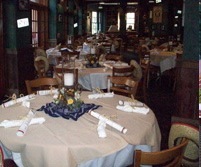 Appetizers include Rattlers (jalapenos stuffed with shrimp and cheese), Seafood Fondue (crawfish, shrimp and mushrooms sauteed in cream sauce, then baked with romano and jack cheese), and Shrimp Chicken Embrochette (grilled shrimp and chicken tenderloins wrapped in bacon and basted with BBQ sauce). They offer three soups, five salads, ribs, pork chops, chicken, salmon or shrimp. Steak comes in eight cuts: kebab, center cut top sirloin, New York Strip, Porterhouse, Prime Rib, Ribeye, and Center Cut Filet Mignon. These are good steaks. We don't think they come from grassfed open range cattle. We think they are the very best of the feedlot raised, mash or corn fed hormone induced cattle. That may explain why Salt Grass brags about its garlic butter and Salt 7 Sauce instead of relying on the pure taste of the beef.